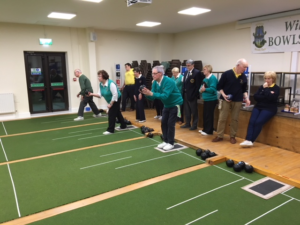 Wilton Bowls Club held their annual open competition in the newly refurbished Parish Centre between 7-10 March 2019. Seventy-six teams of four players each were entered with competitors and supporters coming from all over county Cork and from clubs as far away as West Limerick and Neidín (Kenmare, Co. Kerry). It is fair to say that the facilities in Wilton Parish Centre are the envy of visiting clubs. The lounge adjoining the Zimmermann Hall allowed players and their supporters to socialise between matches and added greatly to the success of the tournament. The prizes for the raffle were, as always, spectacular. Nearly forty hampers, prepared and decorated by Wilton club members provided an eye catching display. Fr. Michael O’Leary SMA, PP, and club member Fr. Don Burke SMA were among the lucky prizewinners. Of course, the bowling was the most important point of the four day competition. The quality of the bowling improves every year and matches were hotly contested. The umpires were kept busy measuring close decisions and some matches ended in a draw and had to go to an extra end before a result was declared. The final on Sunday afternoon was contested between teams from The Cathedral Club, Cork and Glounthane Club from Co. Cork. An appreciative audience was treated to a master class in Short Mat Bowling before Glounthane emerged victorious. Fr. Michael O’Leary SMA, Honorary President of Wilton Bowls Club was present for the final and commended the club for its organisation of the competition. He remarked that the club was one of the first activities organised by the parish after the Parish Centre was built in 1987 and that it was wonderful to see that it was still a strong parish activity. Hubert Burrows, Club Captain thanked Fr. O’Leary for his active encouragement and he put on record the co-operation of Anne Cronin, manager of the Centre, in facilitating the arrangement of the annual tournament and the club’s regular activities during the bowling season. The Club Captain then presented the prizes and the James Gilmore Trophy was presented to the winning team by Kathleen Gilmore, wife of the late James Gilmore, who was a founding member of the club in 1987. This is just one of the many large and interesting programs that the Centre is hosting in the near future. On May 25th the Centre will host a seminar “Women of Faith: A Catholic Conference for Women” for about 200 women. 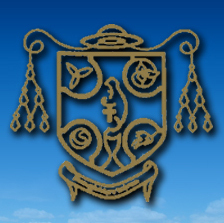 There will be a Mass on the day which will be led by the Papal Nuncio to Ireland, Archbishop Okolo. 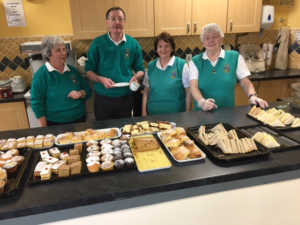 Francis Thomson, Jim Mulcahy, Bridie Nash and Maura Nash get read to serve up delicious refreshments after the Bowling Competition at SMA Wilton Parish Centre. The Centre is also hosting a large group of young people who are preparing a program to raise money for the Irish Kidney Association. The Centre is providing accommodation for about 45 young people for about two months as they learn all their dance routines and hopefully put on a show in the Rochestown Park Hotel on the 13th April at 7.30p.m. The funds raised will go towards a Renal Support Centre situated near the CUH. They hope to have 6 en-suite bedrooms. It will be open all year round and provide free accommodation for all kidney patients and their families. These occasions are wonderful opportunities not just to showcase the Centre and its facilities but also an opportunity for the Society to showcase its own story and how it sees itself being relevant to the world of these people who use the centre. The staff of the centre would like for people who use the Centre to go away not just admiring the recent renovations but also to have learnt something of the history and the objectives of the SMA today. Editor’s Note: Below we have an accont of some of the ongoing events taking place in the newly refurbished SMA Wilton Parish Centre which goes from strength to strength. We hope that through this article, submitted by Wilton Parish Priest, Fr. Michael O’Leary SMA, readers will continue to see the potential of the Centre and how it contributes to the SMA ‘home’ mission today. Wilton Bridge presents €1000 cheque to Pieta House.